Cotton Club was a Center for Celebrities Like Rubinoff and Durante. Why am I blogging about this? Because in these times: Let’s all get happy. Please share this with everyone. Spread the cheer! I worked with Rubinoff and His Violin for some 15 years. He is seated at the piano in the featured picture. Durante is playing Rubinoff’s violin. Rubinoff was at the show biz heart of both of New York and L.A. In the 1930’s he grossed hundreds of thousand of dollars annually. I think we are about to return to glamour and good times. I hope to help that along. It’s time we all had “fun”. Let’s start with Betty Boop. Then we’ll continue with Jimmy Durante and others. Durante was famous for his “big nose”. Everyone seemed to have a gimmick. First, who was Betty Boop? Where there was fun, you be be sure Rubinoff was there! James Francis “Jimmy” Durante and Rubinoff were great friends. Durante (February 10, 1893 – January 29, 1980) was an American singer, pianist, comedian, writer, and actor. His famous nickname was The Great Schnozzola (a reference to his big nose). He was also known for his deep raspy voice. His gimmick was saying: “Ha-Cha-Cha-Chaaaaa!”. He won an Emmy Award in 1952. As for the Cotton Club: Dave told me about how he enjoyed the Club in 1930’s. There was always good food and entertainment. When Rubinoff arrived they always played the theme from his radio show: “Give Me a Moment Please.” He first met Durante at the Club. He also met such celebrities as: Cab Calloway. Lena Horne, Satchmo, Ethel Waters, Joe Louis, Louis Armstrong, and, of course, The Great Schnozzola. Rubinoff told me he also had special reserved tables at Club 21, Mama Leoni’s, Trocadero’s and Lindy’s. I ask my reader: Is that having a good time, or what? Finally, Jimmy Durante was a regular on The Chase and Sandborn Hour with Rubinoff. Once when Eddie Cantor, the host, went on holiday, Durante substituted. Below is an internal link. It tells some of my story with Rubinoff. I hope to spread the fun! To give a lecture. It covered high points of my 15 year association with Rubinoff and His Violin. I will be performing on the piano. My position will be to accompany violin maestro Steven Greenman. We were set to play several arrangements I made with Rubinoff. Also included was a 28 piece high powered orchestra. Assembled for the performance were top instructors. They were from leading musical programs at top universities around Ohio. This performance was the vision of the conductor, Joseph Rubin. 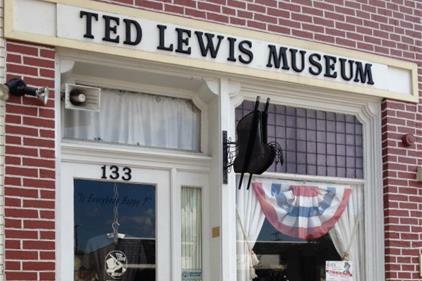 He is also the curator of the Ted Lewis Museum in Circleville. Please keep checking my posts. Samples and segments from the concert will soon be available on youtube. With his trademark battered top hat and clarinet, Circleville’s own Ted Lewis drew standing room only houses. He sold millions of records He starred in every entertainment medium from Vaudeville to Television. His career spanned five decades. So what’s magical about this concert? An element of the mystical is found in the very town of Circleville. The city’s name is derived from its original layout. It was created in 1810 within the 1,100 ft (340 m) diameter of a circle. Many future blogs will be appearing about this 1100 foot diameter. It will illustrate a connection to prehistoric cultures. The Hopewell tradition earthwork dates back to the early centuries of the Common Era. Dave loved the American Indian tradition. I specify this in my lecture magic. He, like many Europeans, was enchanted by Indian ways and wisdom. The decor of both of his homes amply illustrate this great love. It is most fitting that he will be honored at the Ted Lewis Museum. Ted was from Circleville. The Museum is actually almost directly across the street from his residence. I had a personalized museum tour. Wow! #1 spot in American to visit if you love music! Here are some internal links. They will illustrate connections between Rubinoff and His Violin and myself. There are many more posts on DSOworks on this subject. Feel free to explore them. Dave became enormously wealthy playing the violin and conducting. This was throughout the Great Depression. His annual income was as high as $500,000.00. Lots of exciting posts are in the making. The fun has just begun. Please feel free to share this. Musical Museum Sponsors Memorable Concert under the Baton of Maestro Joseph Rubin. Oh my gosh. I now have a tiny place in the Ted Lewis Big Band Museum. In the featured picture, I am in the lower right corner standing with Rubinoff. What is the basis for this claim to fame? I worked with David Rubinoff and His Violin for some 15 years. My capacity was as his arranger and accompanist. Maestro Rubin read one of my Rubinoff posts. They are on DSOworks.com. He contacted me to be a part of a Rubinoff commemoration concert. The concert was June 2, 2018. Steven Greenman was the distinguished violin soloist. The photo below of Rubinoff and myself was taken in concert in 1984. Dave was 86 years of age. Our entire concert is below the picture on youtube. Just click on it. In his heyday, Dave was a national phenomenon. This was to the tune of as much as $500,000.00 annually in the 1930’s. Serious musicians (those who only played classical) were envious. However, the point is, whatever Dave touched was superbly played. Many examples of him are now posted on youtube. Many of these show him playing at his peak. Also below is an internal link with a “Rubinoff” story. Dave Rubinoff and myself after a concert at Scott’s Oquaga Lake House in the Catskills in 1984. The youtube of the concert is below. Ted Lewis’ band was second only to the Paul Whiteman band in popularity during the 1920s. Paul Whiteman led a usually large ensemble and explored many styles of music. He blended symphonic music and jazz. An example was his debut of Rhapsody in Blue by George Gershwin. Many say Ted Lewis played more real jazz than Whiteman. This is especially true with Ted’s recordings of the late 1920’s. American history at the musical museum is quite rich. Much is in the works on DSOworks.com. Keep watching. Rubinoff Experience is Wonderful and a Bit Wild. I ‘m getting ready to board the airplane for my Rubinoff lecture and concert in Circleville Ohio. Maestro Steven Grassman will perform on the violin. A 28 piece orchestra will be featured under the baton of Joseph Rubin. See my internal links immediately below. The first gives the particulars about the concert. Nothing is as wonderful for me as a Rubinoff experience revived. In June of 1970 I set up an audition with Rubinoff. He was residing in a posh penthouse at the Leland House in downtown Detroit. Even before I rang his door bell, I knew I was about to meet a master of show business. While many are only concerned with 1st impressions, Rubinoff made a powerful 1st pre-impression. He had a hand carved wooden door with a violin surrounded by musical notes on staffs and flowers. When you rang his doorbell, it played the musical theme song from his hit 1930’s musical radio show. During that time he became an American icon. Typically, after Sunday church services, Americans went straight home. Their objective was to listen to Rubinoff and His Violin on the Eddie Cantor show, Dave conducted and played with the full NBC orchestra. His theme song, “Give Me a Moment Please”, was chimed by his doorbell. His apartment suite was breathtaking. Dave paid homage to America with his décor. He was born in the Ukraine in 1897. What did the average Ukrainian think of American at that time? The Wild West personified America. Yes, cowboys and Indians. David was particularly taken with the Indians. He loved everything about them. In his suite were countless Indian artifacts and paintings. Many were just given to him by Frank Phillips of Phillips Petroleum. His #1 prized possession was a portrait of himself painted as an Indian chief- feathers and all. First Impressions are Long Lasting Here’s Why. Over some 15 years I toured with Rubinoff and His Violin. I served his pianist and arranger. Two questions beg to be answered. What was His Violin? What is an arranger? His violin was the Romanoff Stradivarius. A Stradivarius violin could be worth hundreds of thousands to several million U.S. dollars . The 1697 “Molitor“ was once rumored to have belonged to Napoleon. It sold in 2010 at Tarisio Auctions for $3,600,000. It was, at the time, a world record. An good arranger can be paid more than a prima donna. An arranger sets the musical context for a melody. It can be compared to the background around a subject of a painting. With the canary story, first impressions were wrong. In the joke (based on truth) she needed the arranger to showcase her voice. This internal link immediately below has Rubinoff and I playing in New York in the Catskills at Scott’s Oquaga Lake House. He was 86 years of age at the time. Its link is connected to connected to Youtube. It is called, Lost Concert Found. Rubinoff and I played a number of school functions. One was for the chamber orchestra at a middle school in Venice, Florida. I must say they couldn’t have cared less for his Stradivarius violin. That was because he carried the violin in a genuine alligator skin violin case. It was made in Germany. It had all of the original fins. Of course, that would impress any child! Please share with friends. My upcoming concert commemorating Rubinoff will be in Circleville, Ohio on this June 2nd. Click on all events for details. Hope to see you there. And yes, I have one or two openings for piano students in Sarasota. Rubinoff played for children of all ages thanks to John Phillip Sousa and the United States State Department. (1) Palestinian cubit square of 4.44 square feet. (2) The mathematically true (not rounded up) figure for the English square yard as 8.88 square feet. Also notable: The Commandments of the Hebrew Torah are also numbered by ancient measures: There are 248 positively stated commandments. The 365 negatively stated ones tell you what not to do. The internal link immediately below explains the +5 discrepancy for the 243 numbers that define the Roman pace and the positive commandments. 1.2165 feet x √5 = 2.72… feet – one megalithic yard etc., up to…(copied from internal link above). 1.2165 feet x √6 = 2.979…feet – It was rounded up to 3 feet. One remen squared = 1.48 square feet. One royal cubit squared = 3 square feet. One Roman pace squared = 6 square feet. One megalithic yard squared = 7.4 square feet. The 1.2165…foot remen x square root of six (as 1.2165 feet x √6) = 2.979…feet) 2.979… ² =8.88 square feet. Of course the British yard is rounded up to a full three feet. When that is done, it makes the square yard equal to 9 square feet. 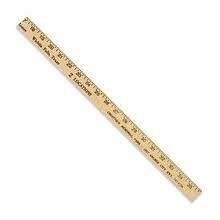 Yardstick based on the full 3 foot long British yard. Repeated numbers also found their way into gematria. That’s the ancient equation of numbers and letters. Damascus, when spelled with Hebrew letters equals 444. (Link is below) Dalet (right to left) is 4, (mem) is 40, shin is 300, kuf is 100 = 444. In this manner, Damascus makes direct reference to the Palestinian square cubit of 4.44 feet. It is well known that “Jesus” spelled with Greek letters equates with 888 by gematria. That makes reference to the shorter “English” square yard as 8.88 square feet. Violin cases created a sensation for Rubinoff. I (blogger David) will be giving a lecture and concert about a composer/conductor/violinist and Hollywood Movie star I worked with. The date is June 2, 2018. It will be at the High School in Circleville ,Ohio. His stage name was Rubinoff and His Violin. He had a talent for being sensational. Even with violin cases. He made a fortune conducting and playing violin: As much as $500,000.00 annually. Wealth came to him at the peak of the Great Depression. So what made him rich? Two internal links are below will explain his rise to fame. The 1st is about the upcoming Circleville, Ohio festivities that will honor him. Click on the 2nd for a youtube sample of Rubinoff of how Rubinoff dazzled Hollywood. His violin wizardry speaks for itself. A poor Russian as a youth, he acquired riches and fame through mastery of the violin. A street gang thought Rubinoff’s older violin case was hiding a machine gun- not a Stradivarius! They carefully avoided us. We’d go to a deli for lunch. It was a blustery wintry day. Dave was wearing a godfather coat and hat. He was so preoccupied humming a tune, he didn’t even bother buttoning the coat. This particular violin case was in sad shape. Yet, it held a 2 million dollar Stradivarius. I saw a gang of about 12 young men walking toward us. At that time they were about 1½ blocks away. As soon as they noticed the violin case, the entire gang jay walked across the street to avoid us. Most likely, they thought Rubinoff looked like an old hit man that never got hit. Until his last year Dave and I played school assemblies for children in the public schools. One was a performance for a chamber orchestra in the Venice, Fl Public Schools. When we made our entrance, everyone was taken by the alligator violin case. Some children could have cared less about the priceless violin. For them, the case said it all. To relive those days in Circleville is priceless. Buy your tickets now!